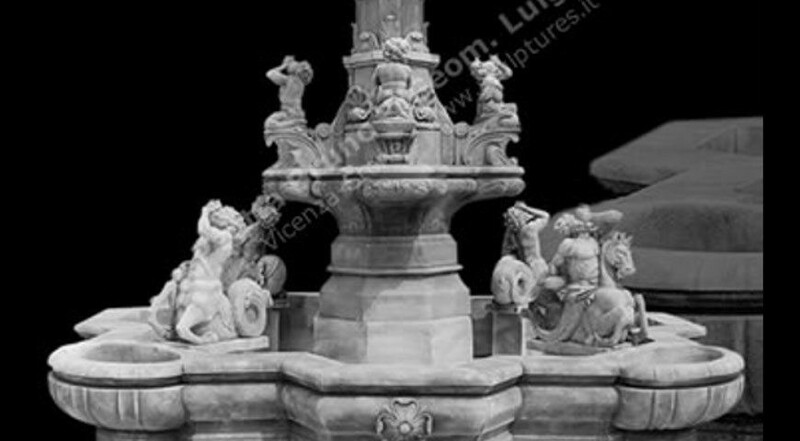 The great Neptune Fountain - original design by antique Trento Fountain: Trento (Italy). Triton on the fountain of Neptune in piazza del Duomo. This statue is a further copy made in the 1920 by Davide Rigatti of the copies made in 1871 by Andrea Malfatti of the original statues. A large Coping with 4 bowls with rosetta decoration. The four antique Centaurus, different design each one is drilled to spout water into the coping. All Centaurus have cornucopias or shells, making a great water effect. The central fountain has a large lobo base with leaves decoration. On this base four cherubs hand-carved sculptures on a base very decorated base with round leaves motif. Each putto have dolphins, cornucopias, shells elements, all driller for water. The large top leaves base support the bigger bowl with bugne details. On the top a Neptune sculpture ( god sea ) with the two dolphins with iron trident. The Neptune sculpture was used a lot in the past, in Roma several Fountains (example Fontana di Trevi) have this great sculptures.